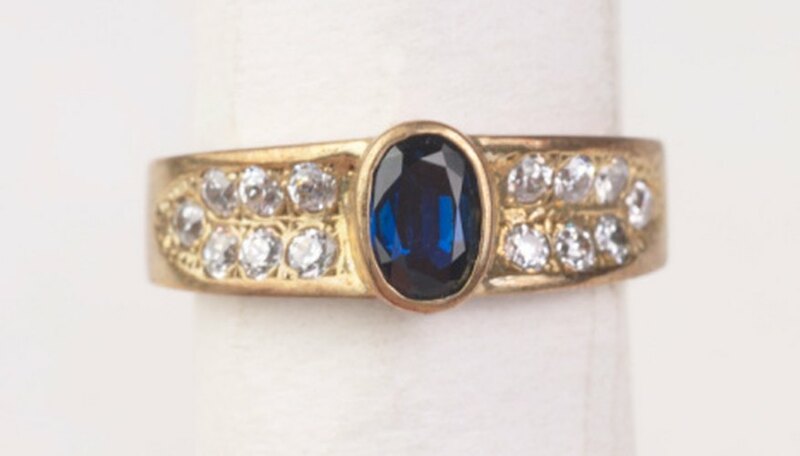 Dark blue stones are among the most rare and expensive stones in the world. Deep blue hues have cultural connotations and attributes ranging from trust and loyalty to wisdom, spirituality and calm. Dark blue stones have been used in art and jewelry for thousands of years, and their popularity only seems to be growing. Lapis lazuli is a dark blue stone containing gold pyrite flecks. It was one of the first stones to be used in jewelry, for which it is still popular today. In ancient times, lapis lazuli was especially popular in areas that bordered the Mediterranean Sea, such as Greece, Rome, Mesopotamia and Egypt. Lapis lazuli can be found in art museums all around the world, as it was used to create blue paint before the mid-1800s. Though sapphires come in a vast array of colors, the dark blue variety is the most commonly associated with sapphire. Blue sapphires come from different areas around the world, including Africa, Australia and Cambodia. Dark blue sapphire jewelry is especially popular for those born in September, as the deep blue sapphire is the birthstone of that month. According to legend, sapphires are supposed to help those who wear them find wise solutions to problems. Tanzanite is a deep blue stone that can only be found in Tanzania, a country in Eastern Africa. It was discovered by Masai shepherds in 1967 and quickly became one of the most sought-after stones of the twentieth century. Tanzanite is actually a variation of the stone zoisite. When the stone first appeared on the market, Tiffany's suggested the name of tanzanite to help appeal to buyers. Azurite is a deep blue stone that gets its name from the Arabic word for blue. Like lapis lazuli, azurite was used in the past for making blue paints. However, while lapis lazuli paint stays true in color over time, paint made with azurite takes on a green hue as it ages. This is due to the oxidation of copper in the stone, which over time turns azurite into the the green stone malachite. For this reason, azurite and malachite often occur together. Sarah Tuttle is a freelance writer and editor. She earned a Bachelor of Arts in English and a Bachelor of Science in environmental studies from the University of New England. Tuttle is a graduate student at Simmons College, working toward an M.F.A. in writing for children.